Something old is new again in home design. By now, many of you have heard or read about shiplap, which as modern as it feels, is really a reincarnation. “It’s not a new thing,” says DeAnne Koppendrayer, who is an experienced interior designer with LDK Builders and her own independent contracting company, Designs by D. “The name is just different.” Koppendrayer is talking about shiplap, a kind of wood (typically white, but Koppendrayer says that color and materials can be played with, depending on the design) that’s typically stacked up horizontally to create texture on the wall or other space. The installation method varies, as well, with shiplap taking a bit more time and care to install than wood paneling. Koppendrayer recommends hiring a finishing carpenter to get the job done instead of doing on your own, although adventurous DIYers might consider themselves up to the task. While commonly installed with a finishing gun and then painted, Koppendrayer says that some are opting for shiplap done in cedar, white oak or other materials, citing designers wanting to bring the feeling of the outdoors inside. In Minnesota, trying to recreate the feel of the cabin at home is a goal for many home decorators. “It warms up the design,” Koppendrayer says. Koppendrayer says that what’s nice about shiplap is its versatility and use in different design concepts. “You don’t want to overdo it,” she warns, saying that the feature should really be used as an accent piece rather than covering an entire wall. “It’s nice because there isn’t that color variation,” she says. As far as where to install shiplap, the opportunities are endless. Koppendrayer says that while the element is usually used in mid-century farmhouses, it can be integrated into most modern designs while remaining current. “Don’t do a room and incorporate it into the design,” she says. Instead, make it part of the elements of the home. 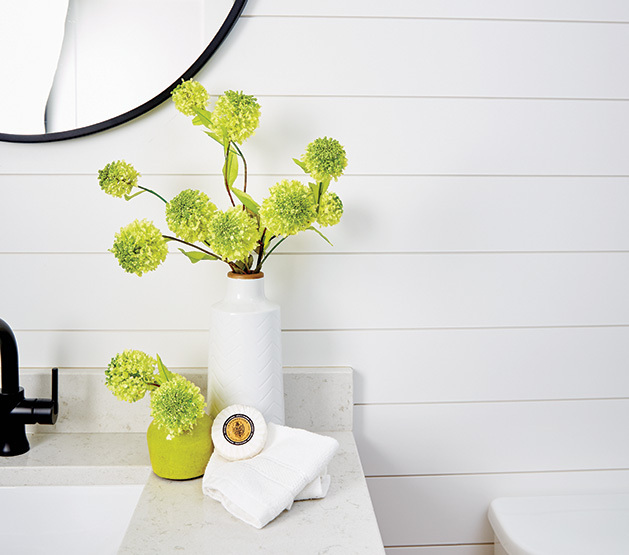 “As long as it follows suit of the style of the home, it should be good.” Koppendrayer has seen shiplap utilized in plenty of creative places, including vanity walls, dining rooms and behind mudroom benches. Like most DIY trends as of late, shiplap’s popularity has risen due to its appearance on TV shows focused on home redecorating. Koppendrayer cites Joanna Gaines of HGTV’s Fixer Upper fame for bringing it into the spotlight. “She makes livable places,” Koppendrayer says of Gaines. With shiplap being an easy, modern addition to a home, Koppendrayer says that it shows your home can have style and substance at the same time.